KONG Yarnimals are lovely cuddly friends in bright colours. The bodies of the Yarnimals are made from a strong yarn, while the arms and legs are limp and fling around wildly while you play. The colourful cuddly toy contains a squeaker for extra appeal. Surprise your pet with a new cuddly toy friend! 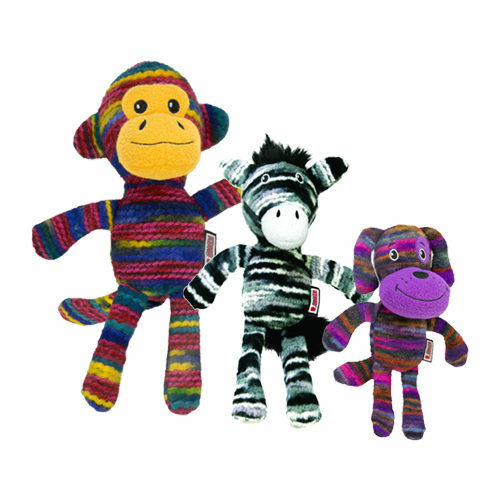 The KONG Yarnimals are cute, brightly coloured cuddly toys. Their body is strengthened with yarn for a longer life. The limp arms and paws fling around wildly whilst playing, which entices your dog to keep playing. A squeaker inside the Yarnimals makes them extra appealing. Have you used KONG Yarnimals before? Let us know what you think about this product.